Are you Seeking a Friend for the End of the World? As the end of the Mayan Calendar nears, are you contemplating what it could mean for you? With some thinking it is the end of the world; the same way there is always an end to the day, the week, the month, the year or any time frame for that matter, a new one ALWAYS follows. But what if it was the end of the World? And your days really are numbered? Would you want to live your life differently, starting now…? 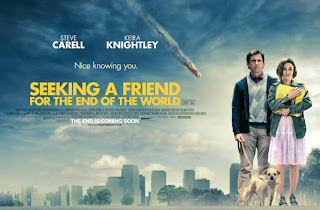 “Seeking a Friend for the End of the World” is a film that explores that and stars Steve Carell (Dodge) and Keira Knightley (Penny). The film runs an accelerated time frame of a couple of weeks to the end of the World – where everyone starts to question life and death and what you will doing just before and when you go. In the opening scene when Dodge and his wife hear the announcement on the car radio, the government has failed to stop an asteroid that is hurtling towards Earth, which means almost certain doom for everyone – and Bruce Willis is not available! His wife then climbs out of the car and just runs away from him and their (long suffering) relationship presumably, as it no longer matters. Although the story has a lot of emotional depth and could have done with more character development time, it is poignant and touches on a very human topic. Forgiving some of the plot holes (related to end of the world stuff) it has comedy, drama and is also a tragedy. Dodge is alone and is contemplating what to do with the rest of his (short) life. “You’re going to die alone,” a female friend of his complains. “He’s going to die with everybody else,” adds her husband. So even though everyone is heading to the same fate, it is a personal journey which at least she understands. Some characters in the film decide to do finally do drugs and get drunk, orgies seem to be the rage, as is rioting. No-one cares about tomorrow, it is only instant gratification that is foremost in their minds and lives now. Some, like Dodge’s cleaner, go about their daily business as if nothing is going to happen. A few, like Dodge and Penny, decide to go find their loved ones and make amends for what has happened and spend their last days with them. How would you feel if you were going to die and everyone else around you? When someone passes or leaves, we don’t mourn their loss per se but more our own loss and that of the relationship that we had created with that person. We don’t feel sorry for them or miss them , as much as we feel sorry for ourselves and miss how they made us feel. No-one else will make you happy if you cannot be happy alone – yet it is our relationships with others that show us who we really are deep down. Other people reflect our good and bad back to us – and we only see that which is in us. Even an optimist couldn’t have changed the ending of the film, hoping everything would carry on and work out. It seems that at as the human race, we are collectively manifesting a lot of death and terror which shows up in the characters of films that we see. So how refreshing to see such a film that lets the characters explores the meanings of their life for a change. The Ending is in the Title of the Film – so the film is about the journey to get to the inevitable conclusion. Questioning LIFE (not death) and what we do with our precious time and most importantly who we spend it with. What would you do if you knew the end was coming and who would you want to spend it with?